All images are clickable, and believe me, you want to click! 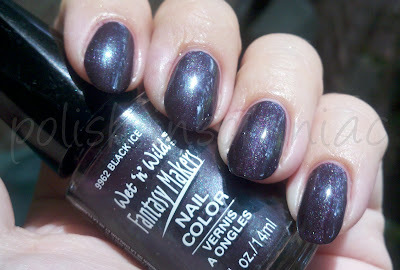 In honor of my August Giveaway (here) I will be featuring WnW products this week. As with the giveaway, all WnW products were purchased by me or swapped for by me. Why the sudden love for WnW, you ask? Well, they were nice enough to name a collection Insomnia after me (click here)! Just kidding. It is, however, what got the ball rolling! Before I became enamored with polish, I never gave WnW a thought. Sure, I used there lip liner all through middle school and high school (#666, I believe), but I never thought of them as having "good" polish. Boy was I wrong! The wise women of MUA straitened me out and got me hooked! Fantasy Makers is a line that comes out around, you guessed it, Halloween. 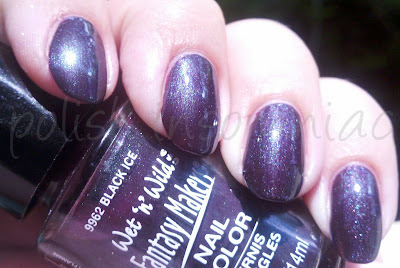 I am not sure when this particular polish was released, because I got it in a swap from Kesha (lol, not Ke$ha!) an ex-pat who now lives in Germany. I have really been into these dark vampy duochromes lately! It shimmers between black, blue, purple, & green. Also, the formula was supburb - no cleanup! So have any of you seen this polish before? I got a few other WnW from Keesha that I will show you towards the end of the week.